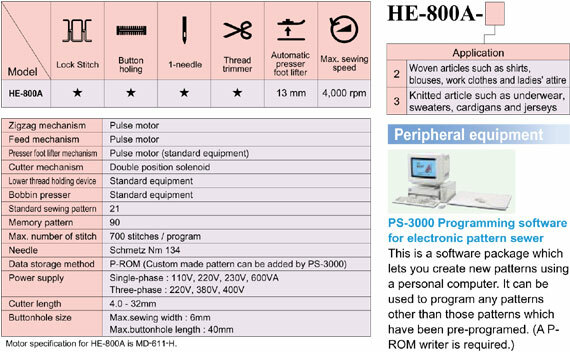 Program selection is as easy as pressing a button on the HE-800A. 90 separate programs can be stored in memory. 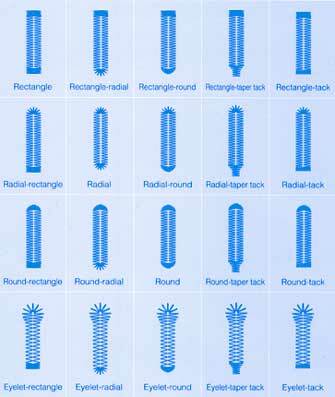 Furthermore, you can add up to 9 original patterns with programming software for electronic pattern sewer (optional product). The presser foot lifter is driven by a pulse motor, so that the height can be adjusted as desired (standard function) for when the pedal is at the neutral position and when it is depressed forward (two stages) and backward. This makes insertion and removal of the material easier and reduces working fatigue. The presser foot rises only by the height necessary, so that the time needed for it to rise and drop can be shortened. No need for adjustments such as replacing cutter cams when changing number of stitches. The cutter vertical movements is driven by a double position solenoid. If not using a cutter, the cutter operation can be deactivated at the press of a key. 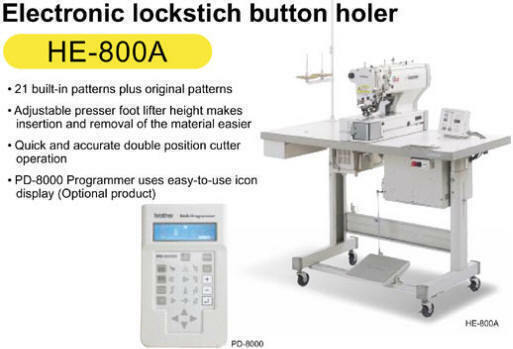 The cutter operates without slowing down the sewing machine, and the cutter response time is also fast, so that cycle time is reduced and productivity is increased. There is a program memo pocket provided on the back of the panel. This lets the operator keep necessary information such as a parameter table, program notes and an error code table on hand for easy reference. The operator can select panel position whichever above or below the work table. A wider operating area is available when the machine head is positioned horizontally on the work table.